This is the place to come get in shape and stay fit! 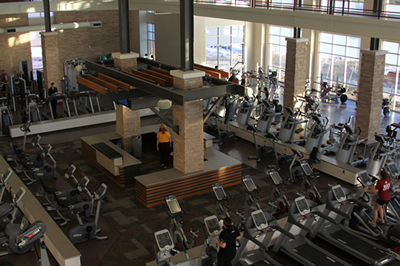 The Hamilton Rec Center has multiple fitness areas equipped with various types of equipment including: Precor ellipticals, treadmills, and AMT's, as well as wall-mounted Versa Climbers, a multitude of stationary bikes, Concept II Rowers, Sci-Fit upper body ergometers, and 19 pieces of Precor strength equipment, as well as 29 pieces of Hammer Strength plate-loaded equipment. Also, we have added a reinforced medicine-ball wall and functional training areas equipped with the Rogue Infinity-24 cross training rig with Olympic lifting accessories, Life Fitness' Synrgy360 XL, and TRX straps located throughout the building for member use. A knowledgeable student employee is always on duty to answer questions. Plyo boxes, Bosu balls, med-balls, and many other accessories are available on the floor or for check-out at a Fitness Kiosk with a MAVcard. The Group Exercise program hosts between 30-40 classes per week during the Fall and Spring semesters. The larger room boasts a breathtaking floating maple floor, and the smaller room is perfect for TRX classes or yoga classes. These rooms are equipped with mirrors, state of the art sound systems, flat screen televisions, and all the accessories needed to get you on the road to a healthier lifestyle. Our Spinning Certified indoor cycling room includes 41 Star Trac NXT bikes with computers to track your distance and RPM's. Throw in our brand new sound system and flat screen televisions and you are set to tackle any of our cycling classes. This is the venue for open recreation activities as well as intramural sports. The most popular activities that are conducted in this area are basketball, volleyball, indoor soccer, dodge ball, and badminton. The gym is almost always available for pick-up basketball. Volleyball courts and indoor soccer courts can be reserved for weekly play. Basketballs, volleyballs, and indoor soccer balls are available for free check out at the Front Desk with a MAVcard. The Hamilton Recreation Center houses two championship racquetball/handball/wallyball courts. Each court has a glass back wall for spectator viewing. Court reservations may be made for one business day in advanced by calling the Front Desk at 970.248.1592. A student supervisor will assist participants with setting up the wallyball court. Eye guards as well as a wallyball kit (net and ball) may be checked out for free; racquetball rackets are available to check out and racquetballs can be checked at the Front Desk. 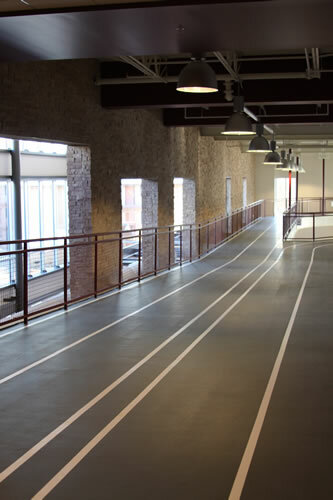 The Student Recreation Center indoor track is open for running, jogging, and walking. The track is two lanes wide and is composed of flexible rubber surface. It takes 6 laps to cover a mile in the inside lane. The unique shape to our track includes a number of right and left hand turns along with a small incline. The Hamilton Recreation Center would like to introduce faculty, staff and students to the new state-of-the-art climbing wall located in the renovated Maverick Pavilion, which re-opened in 2015. 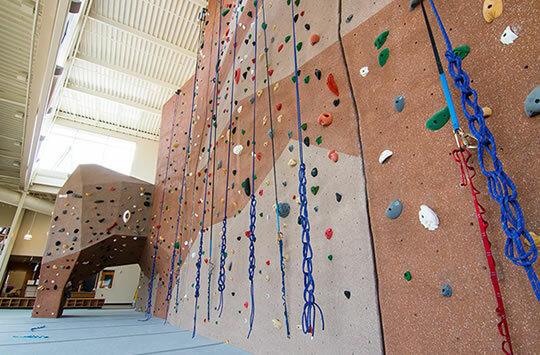 The breathtaking climbing space boasts a 38-foot wall with 2,400 square feet of climbing area. It features a large bouldering area, seven top rope systems and four auto-belay systems for climbers without belaying partners. There is also a climbing training area that includes hangboards, to help with finger strength; campus boards, which a climber ascends using only their hands; and system boards, which help climbers-in-training focus on particular climbing positions. Free beginner climbing classes are available every day of the week to teach the novice climber proper knots and belay techniques. Other classes to be offered throughout the semester, in cooperation with the Outdoor Program, include climbing movement, rappelling, rope rescue, basic lead climbing and lead belaying, multi-pitch climbing and more. Climbing Wall access is for students and faculty/staff members only. All climbing equipment is available at the front desk and can be rented for no charge with a MAVcard. The bouldering and training areas will be open during normal Maverick Pavilion hours; top rope climbing hours are more limited. For additional information, please call the rec center front desk at 970-248-1592. The Dress Code applies when using all areas of the rec center.